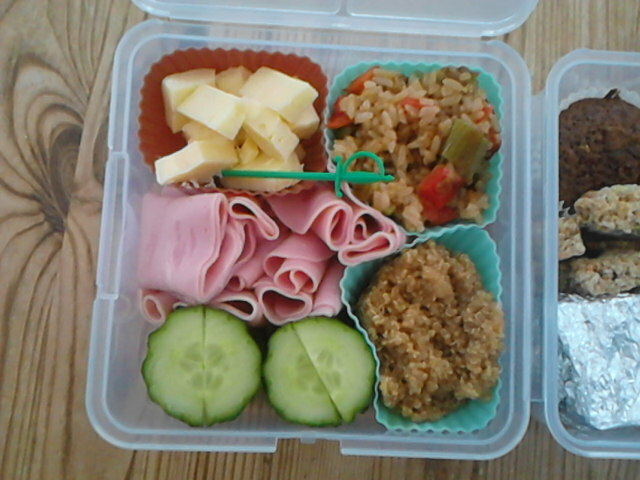 Quick post for a fantastic Bento (if I do say so myself). Had this wonderful gem yesterday and I was ecstatic the whole of the day because of it. 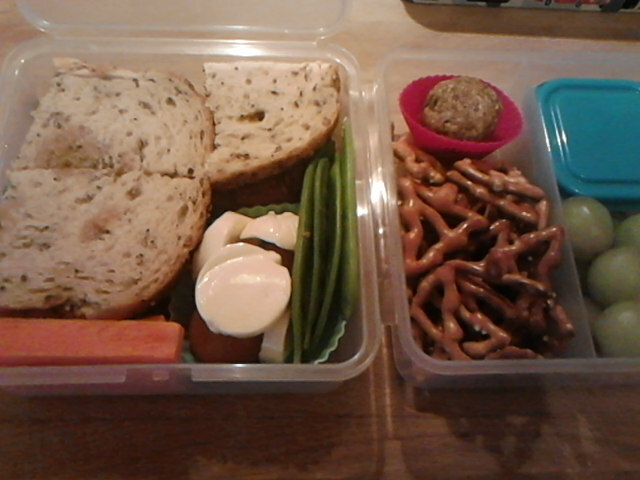 I’m not sure whether it’s the colours, or the range of foods in it, or that I managed to fit that much food in a small bento box! 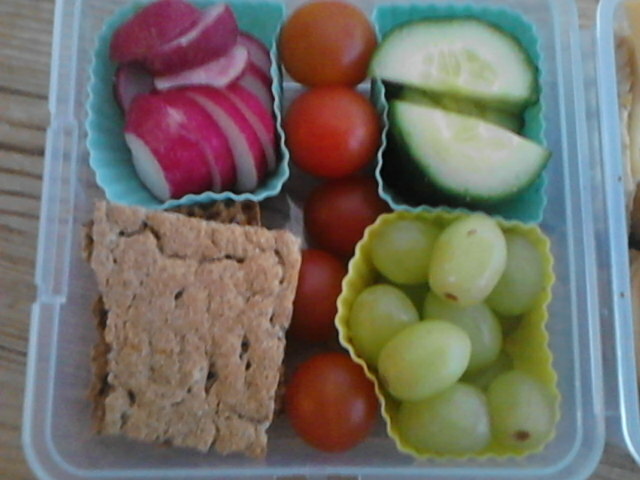 In this tightly packed sistema box, (starting from top left) I had beetroot, sushi rice with sushi vinegar and furikake on a bed of lettuce, mixed salad with lettuce, pepper, olives, mange-tout, carrots and baby sweetcorn, crunchy cheese rounds (microwaved cheese crispy things), pancake muffin topped with grapes (cut into tulip shapes), cherry tomato and carrots. What super colourful meals have you made recently? I have a horrible cold today 😦 so I have only eaten one boiled egg and a little yoghurt 😦 It was meant to be a fast day anyway, although I will eat if my body tells me to. 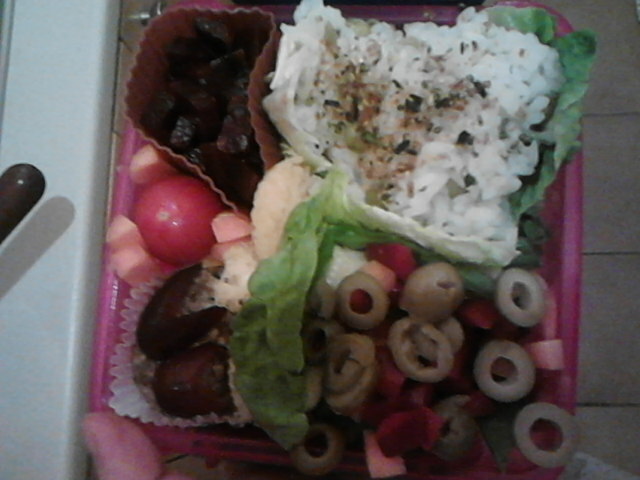 The main side of this bento (made in a Sistema Lunch Cube), had chicken dim sum (not homemade! 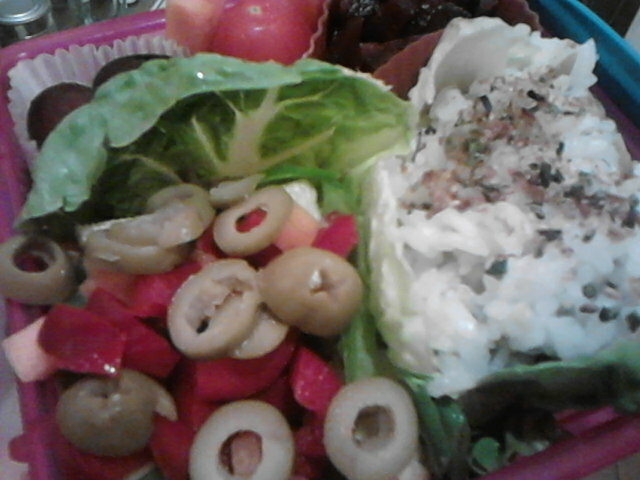 ), steamed broccoli (with sesame seeds), mushrooms (with kewpie mayo), cucumber, peppers, tomatoes and soy sauce. And in the other side there was sliced pear (excuse the bruising, I eat them however they look),chicken slices, satsuma, nest cake and a little pot of sweets. There, that’s made me feel better (pulls ill face). At least you guys and girls get to see a bento post regardless of my woes. I really do need to work on my photos though!! Do you use a camera or your phone to take blog/food photos? I can never be bothered to get the camera out! Bad me! I had a little request from the Bf the other day. I wasn’t going to be home for dinner, but he said he really wanted to have some of my lovely home-cooked food that night for his dinner. As he was so nice about it, and because I had leftovers from the night before, he got a bonus dinner with his lunch bento!! 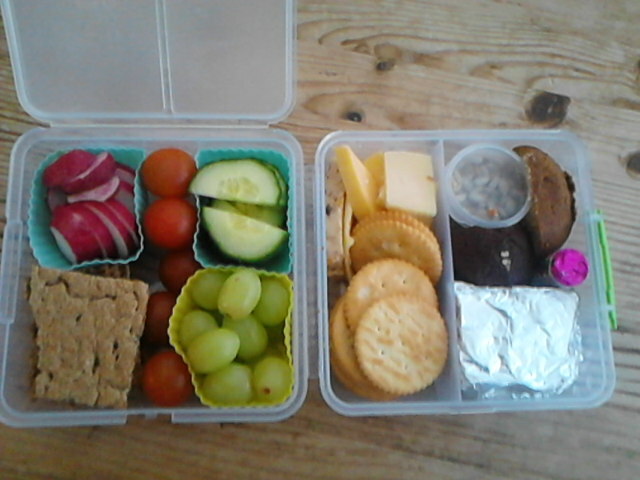 Firstly, in his lunchtime bento, he had one round of cheese, tomato chutney and salad sandwiches (on mixed grain bread), half a round of marmite sandwiches, a silicon cup of cherry tomatoes and smoked cheese, carrot sticks and mange tout. To accompany that, he also had: Christmas tree pretzels (I know it’s February! 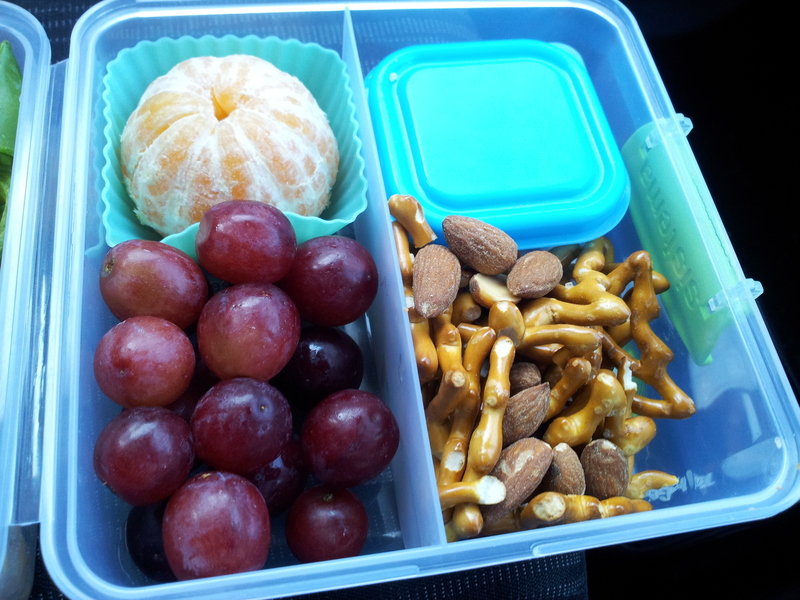 ), a protein ball (recipe to follow), a peanut butter shortbread cookie under the protein ball (again, recipe to follow), grapes, satsuma and a pot of mixed nuts and raisins. To extend the spoiling, the bf had the above for dinner: ramen noodles with stir fry. The stir fry had carrots, sweet potato, courgette, onion and bacon in, and the sauce for it was made with soy sauce, rice vinegar and sesame seeds 🙂 There was also fresh fruit for his pudding 🙂 so healthy I know! I’m starting to plan my first charaben (kyaraben), but I have no clue what to do for it! Any ideas anyone? Yummy yummy yummy yummy fajitas! So today, I had a fajita, filled with chicken and peppers, cooked in fajita spices, with sour cream, salsa and a little bit of grated cheese. There are a few almonds in the small blue pot. 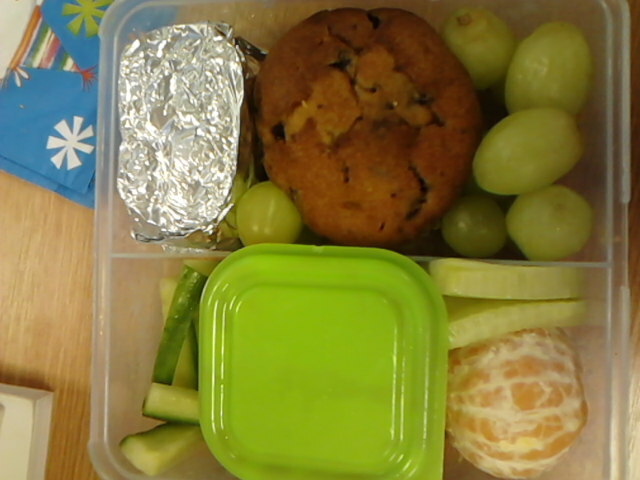 In the other half of the Sistema Lunch cube is sliced cucumber (with more sour cream and salsa to dip in the small green pot), satsuma, grapes, blueberry muffin and malt loaf. 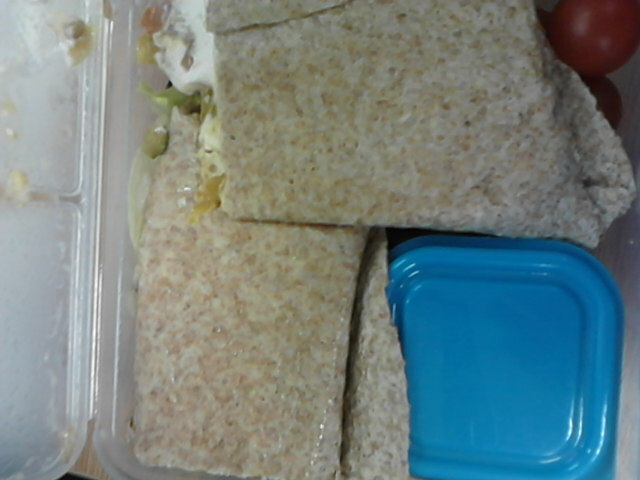 I rarely have sandwiches! This is a new one for me 😛 Or is it? 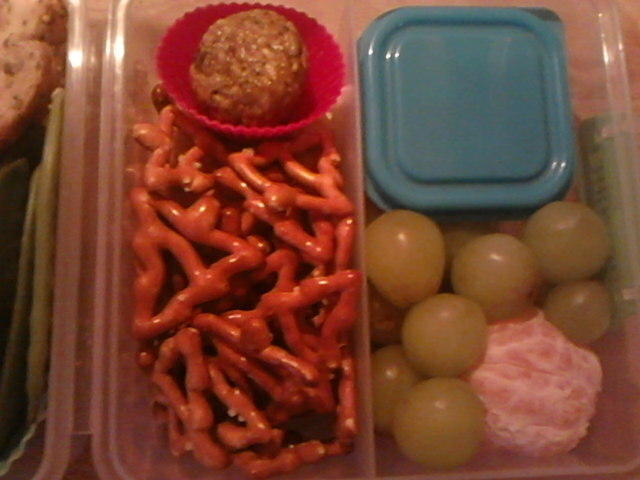 This is the bf’s bento, not mine. So what do we have? 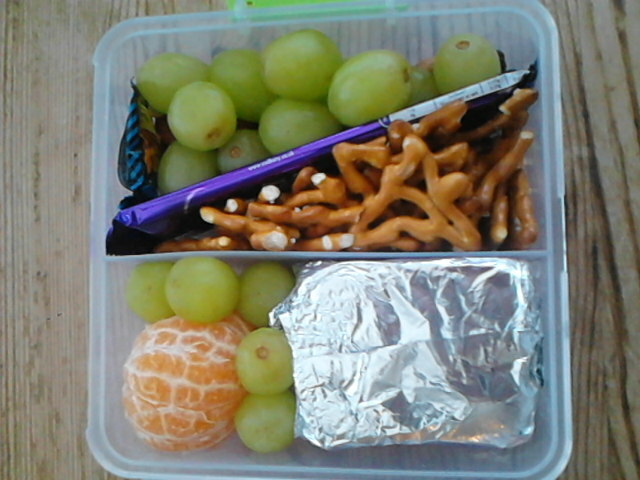 In the Sistema lunch cube, we have grapes, satsuma, christmas tree pretzels and malt loaf (wrapped in foil). 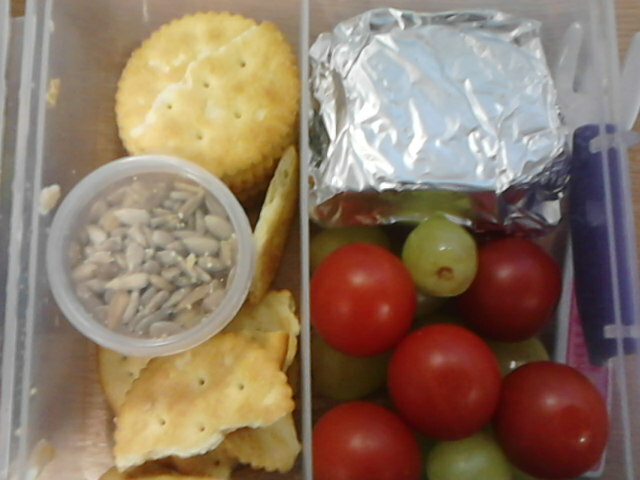 Under the grapes are mixed nuts, and to separate the grapes and pretzels, we have a small bar of dairy milk. there is also a small toxic waste sweet in there too. 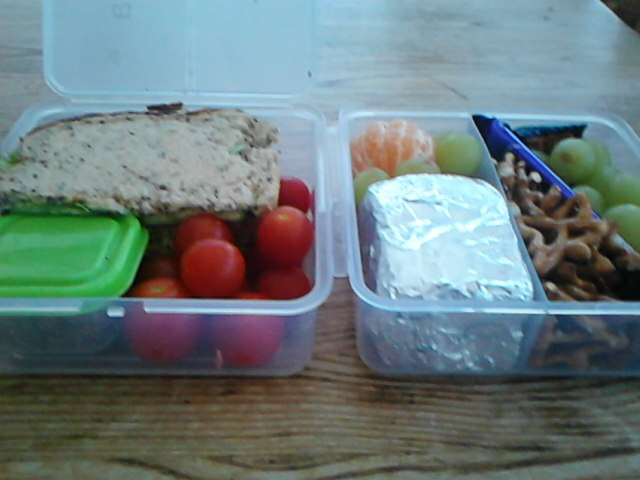 For the main bit, he has spicy ham salad sandwiches (I snuck a bit of wasabi in there), cherry tomatoes and almonds (in the small pot). 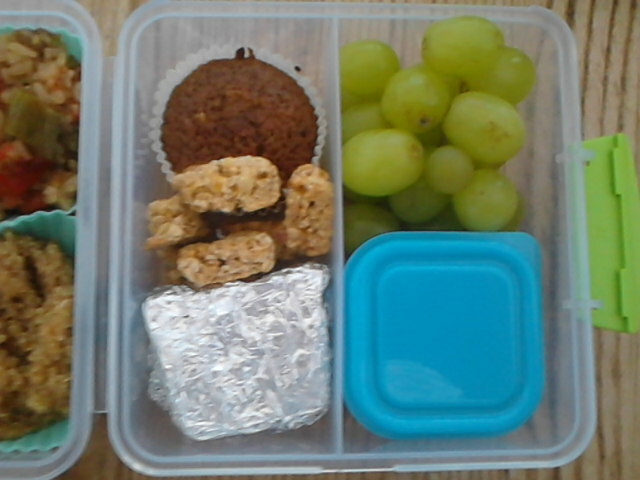 I think this may have been the first time I have used my new small pots in a bento! They are really handy and fit really well. 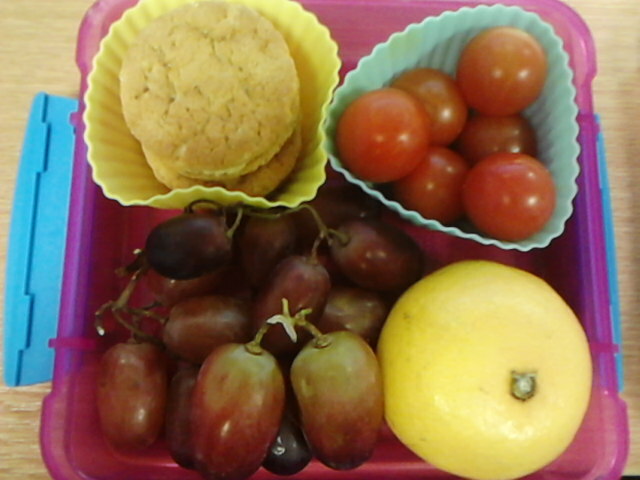 I’m trying to get better at taking photos of my lunches, so here’s another angle (above). I hope everyone is keeping safe (whatever temperature you may be experiencing). It is soooo chilly here! 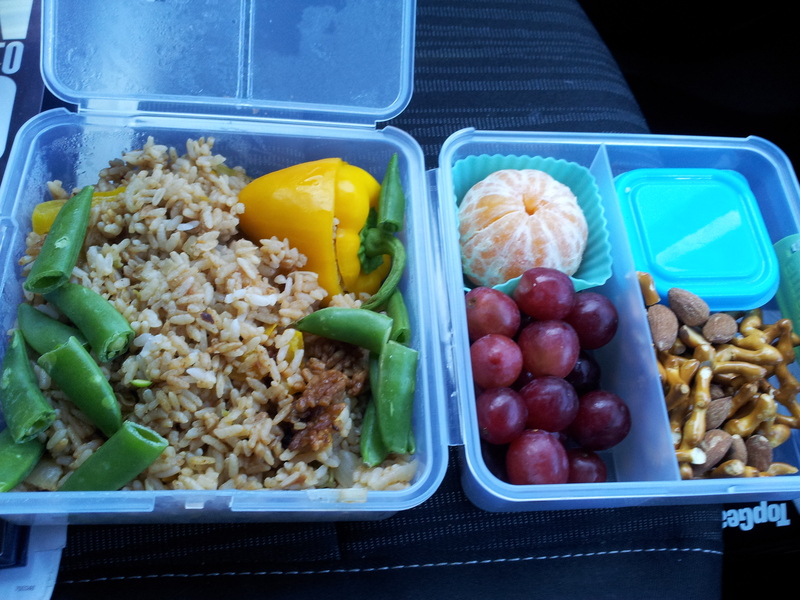 I really love Bento 😀 It’s so cute and so easy to make healthy! 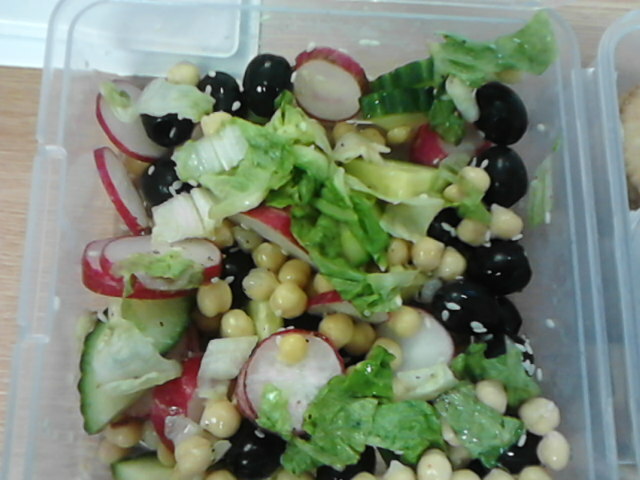 And the main part was a lovely mixed salad with shredded lettuce, radishes, cucumber, black olives and chickpeas 🙂 No salad dressing, no need for it :D, so yummy on it’s own. 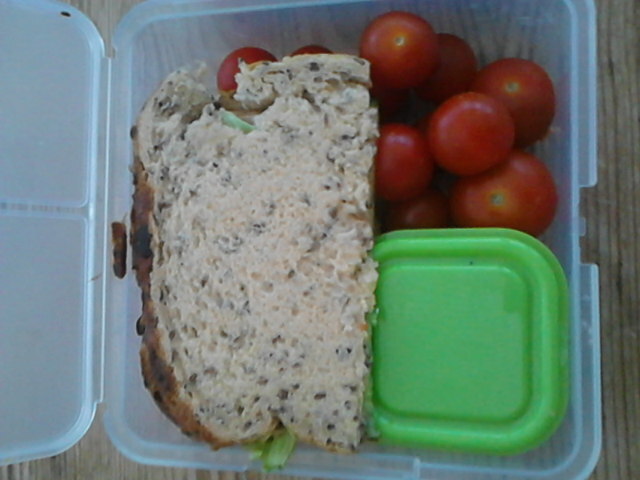 The main half contains Rivita crackers sandwiched with Marmite, radishes, cherry tomatoes, cucumber and grapes (notice the healthy eating? ;P). 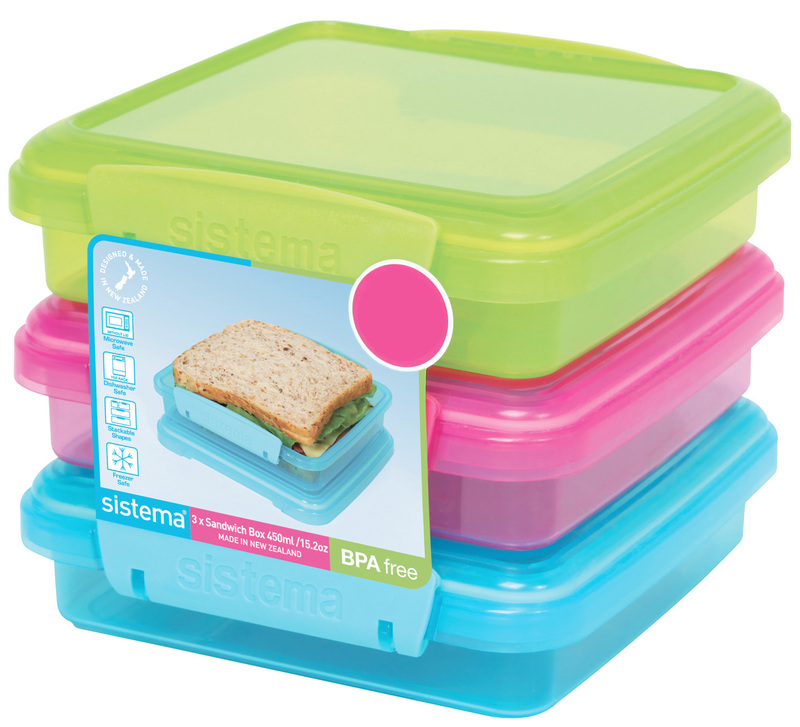 I love silicon cupcake cases, they are the best! In the other half, there was a cheese platter 😀 A mixture of leftover cheeses from the holiday season, with Ritz snack crackers and bacon cheddar crackers. 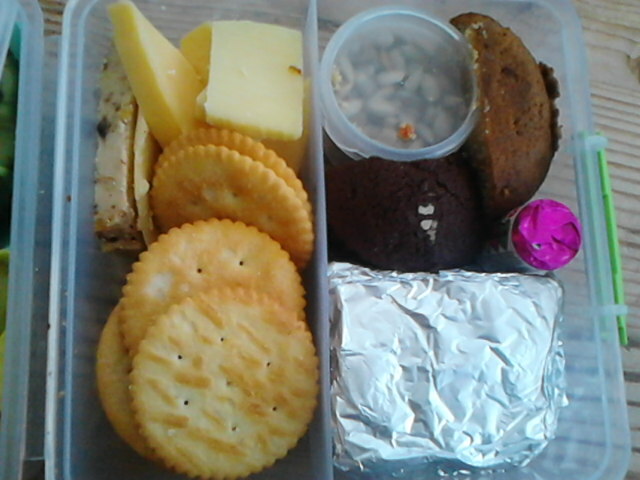 Then we have a little pot of sunflower seeds, 2 muffin halves (one half choc fudge and one half carrot cake), mini pack of love hearts and buttered malt loaf (in the foil). Does anyone have any requests for anything that I can add to this blog? 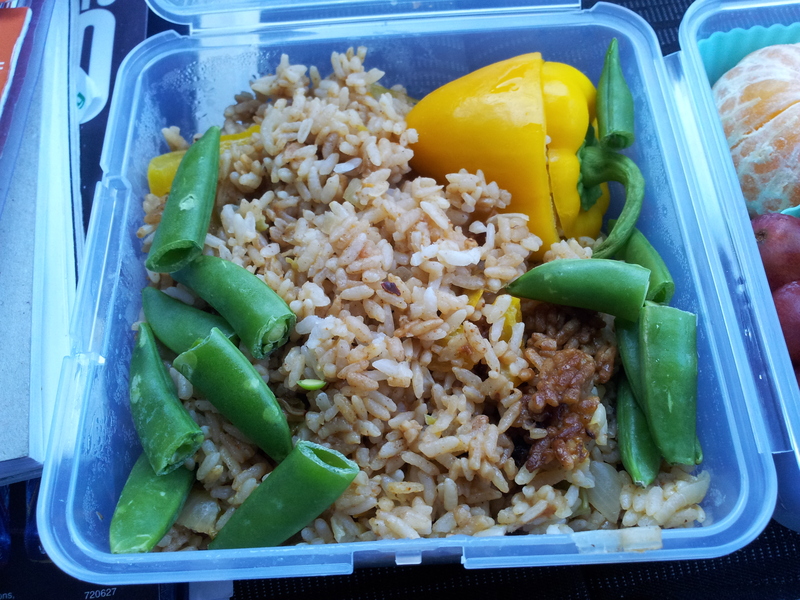 Such as Bento how to’s, more recipes, ideas for saving money on bentos?